Coming out of high school, it was quite apparent that Evan Gill was something special. At 6’3, 245-lbs, he was an impressive physical specimen. 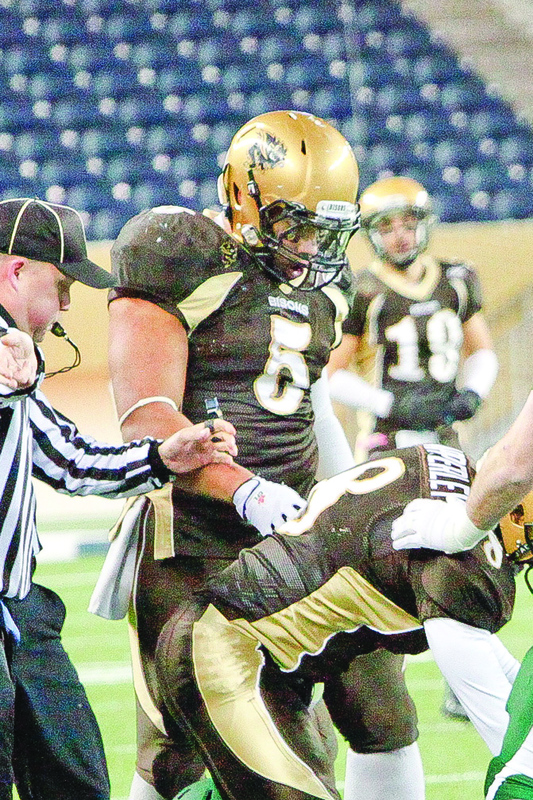 A three-time provincial team member, as well as part of the 2008 ANAVETS Bowl championship team with Churchill High School, Gill was highly sought after by many university programs. The University of Manitoba was fortunate to recruit him to play for the Bisons. Gill emerged as one of the team leaders on defence, and received opportunities to play in showcase games, such as the 2012 International Bowl. Just this past weekend, the now 292-lbs Gill had the honour of playing in the East-West Shrine Game, becoming just the third Bison (Israel Idonije and Jason Rauhaus were the others) to do so. At 89 years and counting, it is the oldest college all-star game in the United States. After redshirting as a rookie in 2010, Gill adjusted just fine to the CIS game. Over the course of three seasons with the Bisons, Gill has accumulated 84.5 tackles, 7.5 sacks, and two forced fumbles, all without missing a single conference regular season game or playoff contest. Just like the adjustment from high school to university play, there was also a learning curve heading down to Florida for the big all-star match-up. Gill had to adapt to the differences between the Canadian and American games. Once you get down to the basics, however, football is still football. Gill was able to do what he does best, which is make plays and create an impact. Gill spoke of a conversation he had with Israel Idonije, Detroit Lions defensive lineman and Bison alumnus. Having been through the same process, Idonije offered advice and words of encouragement when Gill mentioned that things weren’t going too well at the start of the week. Gill mentioned that he intends to train with the NFL star within the next few months up in Chicago, as he attempts to hone his skills ahead of the CFL evaluation camp in late March. Since the day Gill signed with the Bisons, head coach Brian Dobie has been proud to have him on the football team. With Gill looking to make it into the professional ranks, coach Dobie had nothing but positive things to say. While the next few months will bring tons of excitement for Gill as he tries to dictate his own future in football, he remains focused on the here and now. Almost immediately after the Shrine Game had ended, Gill took a second to enjoy the moment, and then was back at it. He is currently training twice a day with Athletic Edge in Bradenton, getting himself ready with combine-specific drills. He is on the field in the morning and in the gym in the afternoon. Gill will return home in March for three weeks, before heading to Toronto for the incredibly important CFL evaluation camp, taking place Mar. 21-23. In his typically humble fashion, Gill is taking everything in stride, but continuing to work hard just as he always does.